Note 1: Like Beat ‘Em Ups? Check out my reviews of Crows: The Battle Action, D & D, Double Dragon II, Final Fight Guy, Final Fight II, Mighty Final Fight, Nekketsu Oyako, Sengoku 3, and Warriors of Fate! Note 2: This game was played on a Sega Genesis 3 game console. The console was connected to a 32-inch HD tv with AV (red, yellow, white) cables. Quick History: Bare Knuckle III was released in Japan for the Sega Mega Drive home console in 1994. 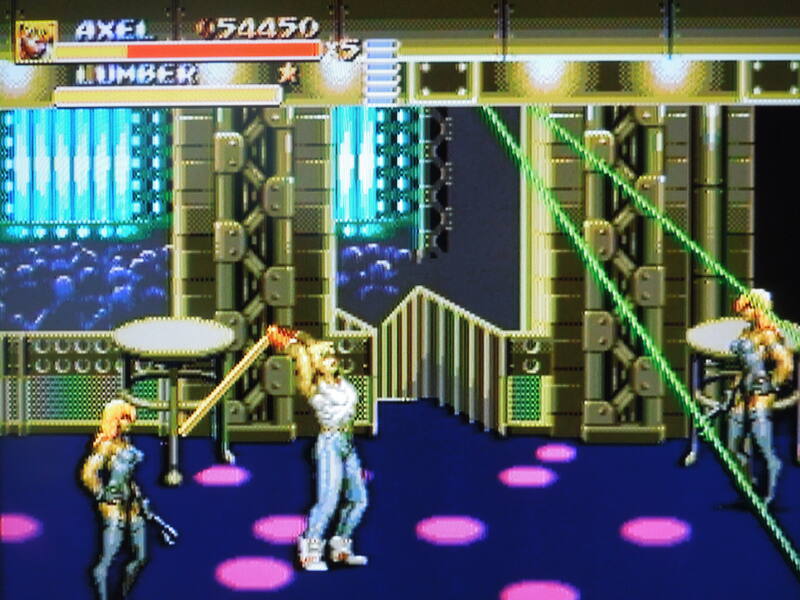 In the United States, the game was released under the title Streets of Rage III for the Sega Genesis (the name of the Sega Mega Drive in the U.S.). 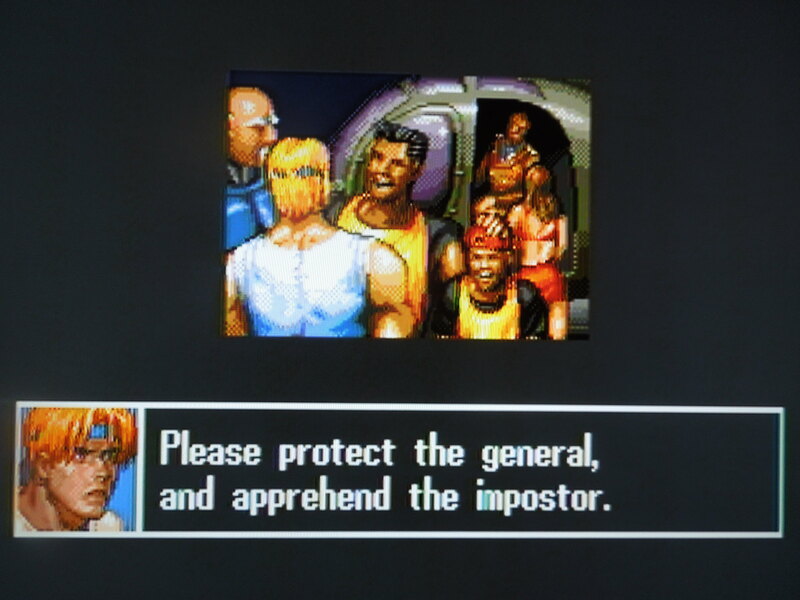 Although the he U.S. version’s gameplay was essentially the same, the game was significantly altered in terms of its story, the difficulty of the game, and the removal of a controversial character in the game. 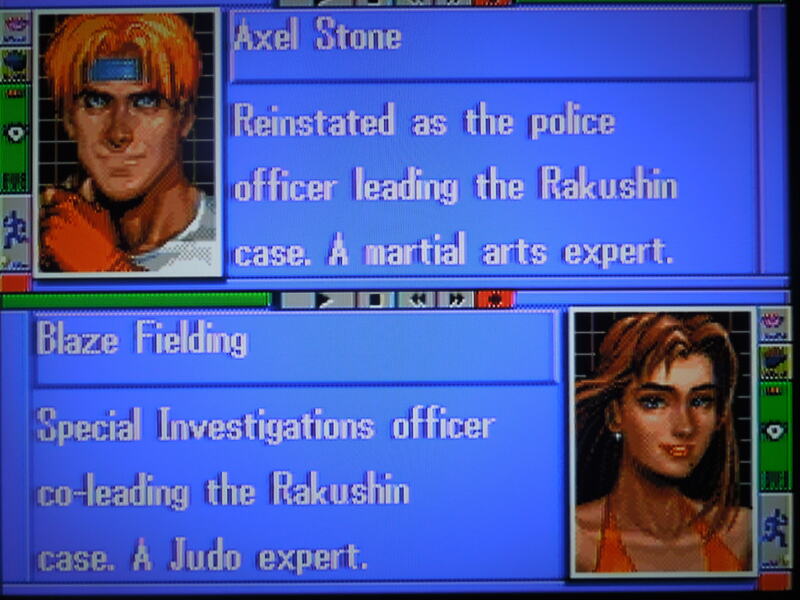 Because of these changes, Bare Knuckle III and Streets of Rage III are two quite different experiences. Today, the original Japanese game Bare Knuckle III has been translated into English, and it can be placed onto a Sega Genesis cartridge (which is slightly smaller in size than its Japanese counterpart for the Mega Drive) for play on a U.S. Sega Genesis console. 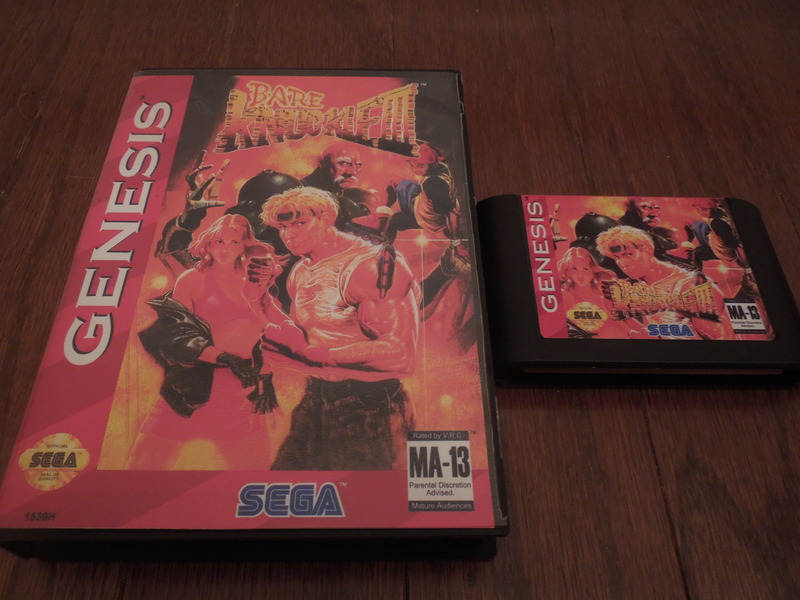 This review is for the translated Sega Genesis reproduction cartridge, Bare Knuckle III. Bare Knuckle III was formerly only available in Japan, but today, translated reproduction cartridges allow the game to be played on the U.S. Sega Genesis. 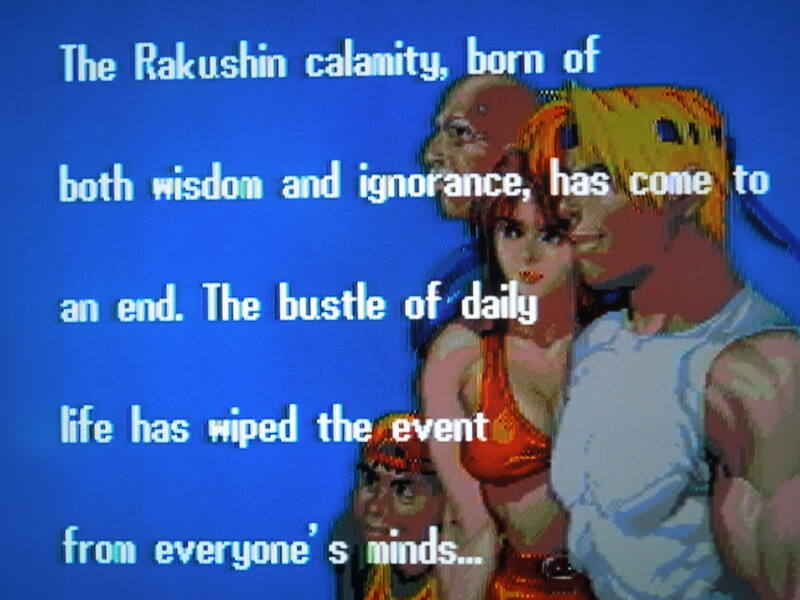 Story: In Bare Knuckle III, Wood Oak City, the home of the game’s protagonists, has been hit by a nuclear bomb which contains a drug called Rakushin, killing tens of thousands of people and injuring even more. Now, 2 police officers, Axel and Blaze, and their friends, Sammy and Dr. Zan, must track down the Syndicate, an organization that has stolen more Rakushin and intends to detonate another bomb with it. Cut scenes and text dialogue play between each level that advance the story, and not only does this move the game beyond a simple Beat ‘Em Up, the story itself is a more ‘mature’ story than what is found in similar games. Additionally, different endings can be achieved based on if you accomplish certain objectives in the game’s final 2 stages. 2 Cops and their friends must stop a catastrophic event from occurring again in their city. 2 Player Battle: You can select from the game’s 4 characters (plus Victy, a boxing kangaroo, if you hold Up + B then press Start at the opening menu screen) for a head-to head matchup. After selecting your fighters, you’ll duke It out in one of several selectable environments (all coming from the game’s Story Mode). The game keeps track of who played as whom, and what the win/loss record of each player is. Additionally, each player has unique quotes for winning and losing. This is actually quite a fun mode, and a great way to practice with each character. 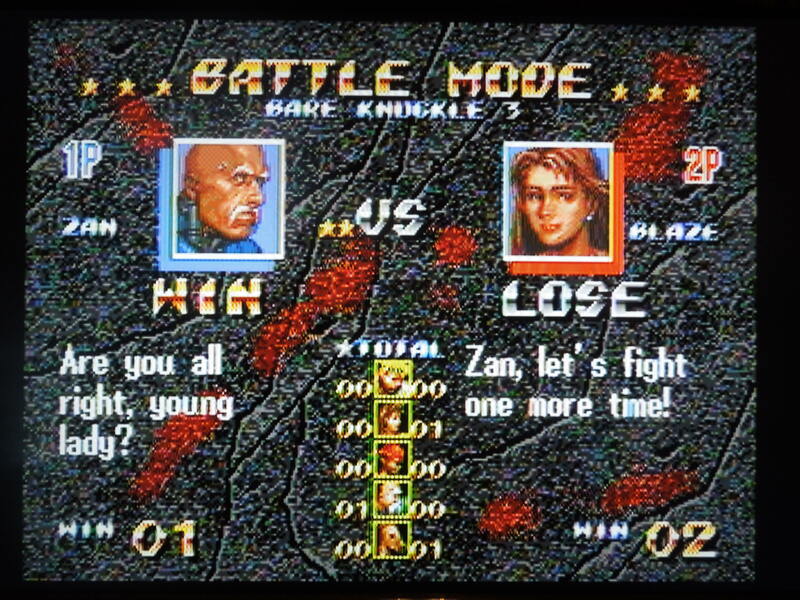 2 Player Battle Mode is well-executed here, with the game keeping track of win/loss records. Control: Although the back of the game box recommends a 6 button controller, I only used a 3 button one, and that works just fine. You can alter the controls in the Option menu, and this is the setup I went with – A attack. B jump. C special. Your chosen character can run by pressing Toward, Toward, and can attack on the run by pressing A. Pressing Down, Down, or Up, Up causes your character to roll (evade) in the respective direction you pressed. When in close to an enemy, pressing A grabs him or her, and pressing A again executes a throw. Special Move and Stars: You have a ‘Special’ bar beside your life bar that slowly fills up. When it’s full, you can execute your Special Attack (C) without costing you any of your life bar. Also, if you play the game long enough without losing a life, and you gain a set number of points, you gain Stars beneath your life bar. Each Star you gain enables you to execute a stronger running attack move. You can get up to 3 stars, but after you lose a life, any Stars you’ve gained will be subtracted by one. Gaining ‘Stars’ by staying alive and earning points increases your character’s power. Music and Sound: Bare Knuckle III has a good variety of music for its 7 rounds, each which are significantly different from one another and suitably atmospheric. The sounds effects (for a Genesis game) are good. Punches, kicks, slams, Specials, explosions, and the screams of defeated enemies all sound pleasing. Weapons, Food, Items: Bats, knives, swords, and grenades can all be found or taken from enemies. After a set number of hits, however, they’ll break. Food can be found in the form of turkey and apples (you’ll find these often), and it will replenish your life bar. Gold bars and bags of money can be picked up to wrack up your points total and get you to a ‘Star’ faster. Additionally, occasionally, you’ll find 1Ups hidden in barrels. You also gain 1Ups by gaining certain point totals. Axel vs his robot counterpart. Difficulty: The game has four difficulty settings – Easy, Normal, Hard, and Very Hard. You can beat the game all the way through on any difficulty setting, but greater percentages of your health are drained by enemy attacks on higher settings. You shouldn’t have any difficulty at all beating the game on Easy, especially if you stay alive and get the Stars that make your running attack extremely powerful. Hidden Characters: Victy, a boxing kangaroo, can be used from the beginning of Story Mode by putting in the aforementioned code, or by NOT defeating him when you encounter him in the game. 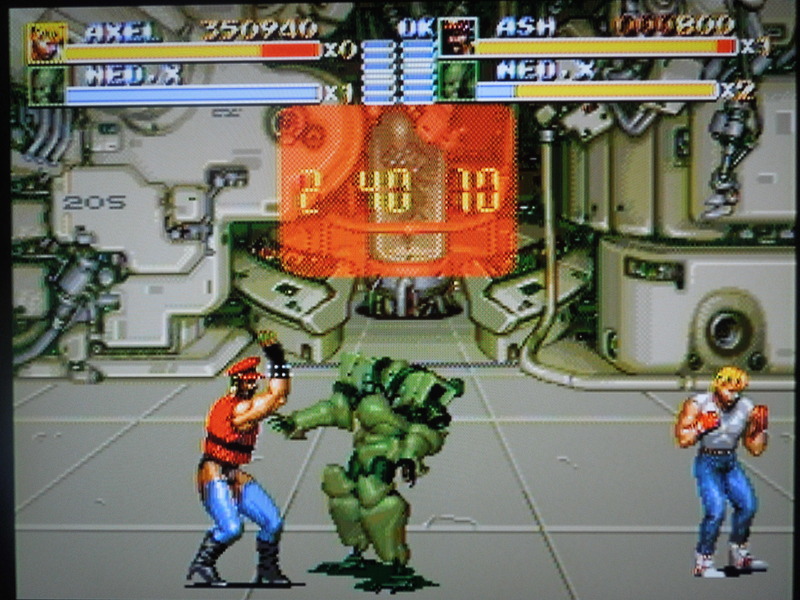 To use Ash, the first boss, defeat him then hold button B until the start of the next stage. To use Shiva, defeat him, then hold A until the start of the next stage. For all 3 of these characters, you’ll have to lose all of your lives and elect to continue – then they will be selectable from the character list if you performed these actions. This controversial boss, Ash, had to be removed when the game was released in the U.S.
Bare Knuckle III (Japan) vs. 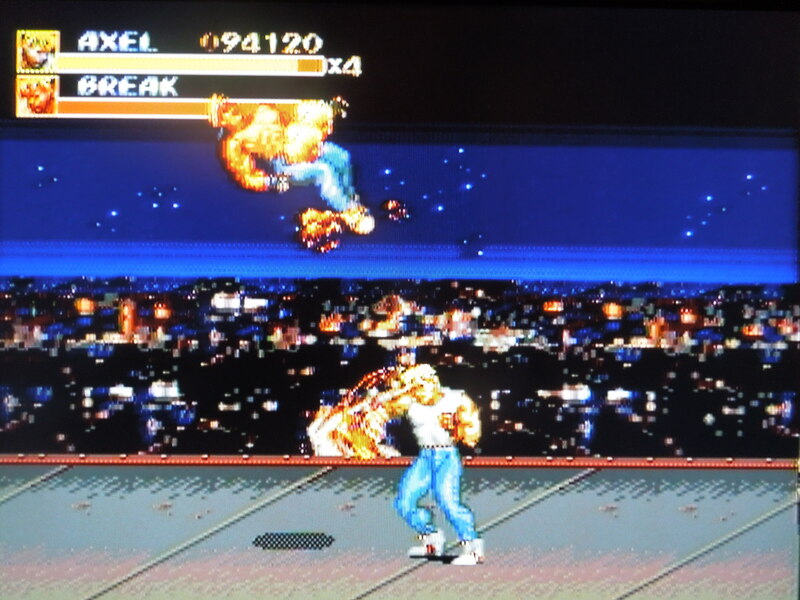 Streets of Rage III (U.S.) As I mentioned, there were many changes made to the U.S. version of the game, and not just the title. The difficulty level in Bare Knuckle III is far easier than in Streets of Rage III – beating the game on Easy in BNIII is actually ‘easy,’ while the Easy in SoRIII is much more difficult. 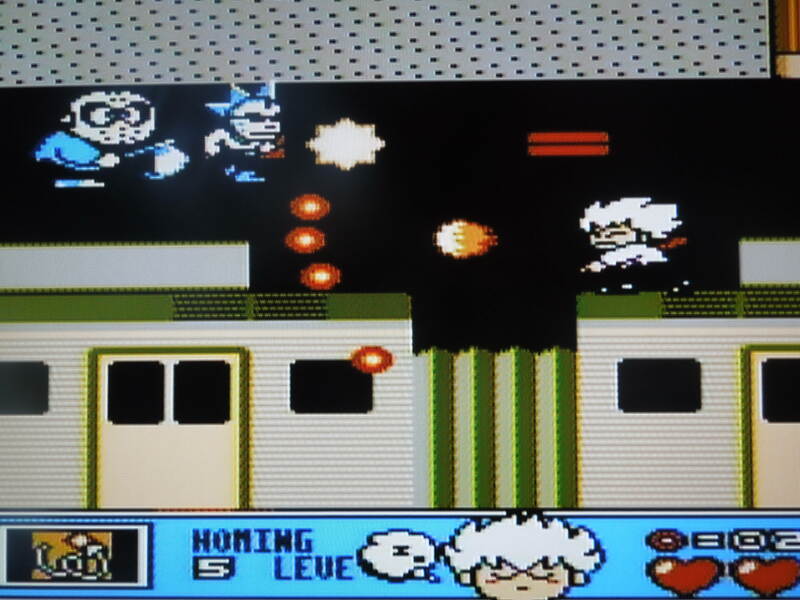 The story in the U.S. version of the game removes completely the nuclear attack and references to the drug Rakushin, instead opting for a story involving robots being used to replace city officials. Female enemies were also given less revealing outfits in the U.S. version. Last, but most obviously, is the removal of the character Ash from the U.S. version. Ash is clearly a gay-stereotyped character with effeminate mannerisms and moves. He was given stockings and high heels, and when he dies, his death scream is the same as the death scream of female enemies. As a playable character (using the aforementioned code), Ash is powerful, though, executing strong regular attacks. He can’t pick up weapons or throw enemies however, with his face turning red and him giggling when attempting the latter move. 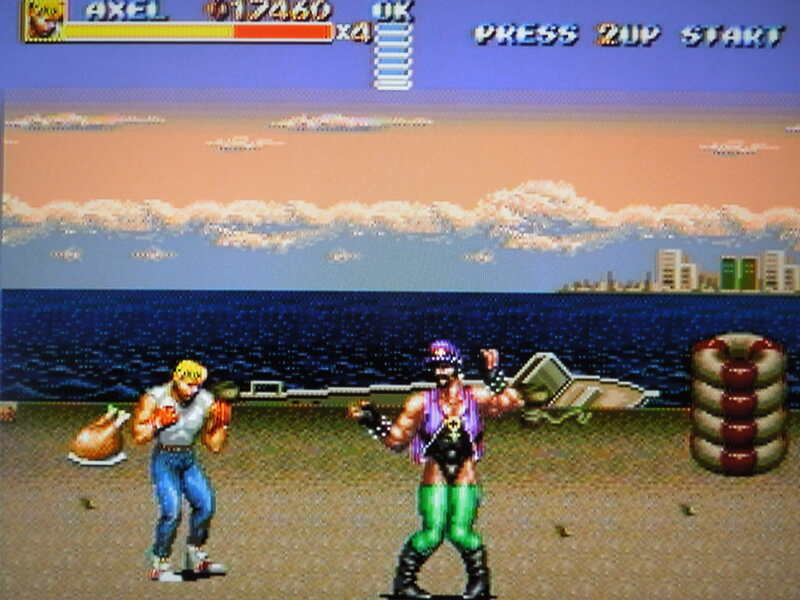 There is no doubt that had he been included in the U.S. version of the game, Sega would have been in trouble. Note: The Southern Gentleman does not support any form of racism, sexism, stereotyping, or discrimination whatsoever. Whether or not you accomplish timed objectives in the game’s final 2 stages impacts the ending you’ll get. So, where can I find this game? You can find the untranslated Japanese original cartridge of Bare Knuckle III on eBay, as well as the U.S. version, Streets of Rage III. Some online sites offer a translated reproduction cartridge like the one used for this review, you’ll just need to do an Internet search. I believe the game has also been released on Sega compilation discs, and may also be available for download on some popular modern gaming services. You can also play the rom on a computer emulator. Cut scenes and dialogue between rounds create a great story. Conclusion: Bare Knuckle III is a terrific Beat ‘Em Up. It is a rather long game, and it has more of an involved story that your standard Beat ‘Em Up. Each character has his or her own strengths and weaknesses, adding diversity to the mix. The controls are excellent, and the music and sound effects (on a system not known for it) are quite good. This entry was posted in Sega Mega Drive - Bare Knuckle III and tagged Bare Knuckle III Sega Genesis Review. Bookmark the permalink.